Whilst the warm weather has made me productive in some areas (getting the washing done and dried), it's made me lazy in other areas (slaving over a hot iron/computer to write my blog/hot stove etc etc). Tea last night was an indoor/outdoor barbecue (last Friday's post will fill you in on this). We ate the leftover food from Friday's barbecue along with salad and new potatoes. I always over-estimate the number of new potatoes I need (or rather that the husband will eat - approximately two) so was left with a huge pile in the fridge. Having been to lazy to make myself sandwiches last night, I had an epiphany at about 4am this morning as to what to take to work for my lunch - potato salad. 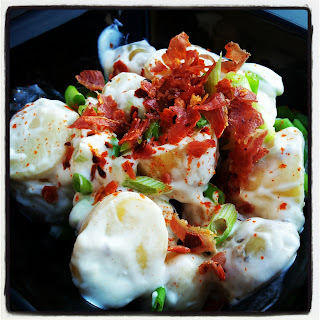 Not just any potato salad, but a Caesar dressed potato salad - the idea coming from a recipe I happened across on Friday when looking at recipes for Caesar dressing. Bingo. I still had some dressing left from Friday so stirred one bowl into the other and hey-presto, I had lunch. A little heavy on the prosciutto! To give it some body I also threw in a chopped up frankfurter (we always have them in the fridge because it's about the only lunch the husband can make for himself). It was a really nice lunch - mostly because my beloved grandma used to make me a similar potato salad with frankfurters for my lunch when I was a kid (and probably why I was so fat back then). Because my dressing had been 'developing' in the fridge for a couple of days, I will admit that iit tasted fishier than I remembered from Friday and if I'm honest and was making it again, I'd probably leave them out because I'm really not a fan and I'm sure the dressing tastes fine without them - it's just obviously not a true Caesar dressing. You can find the original potato salad recipe here. It's much easier than the one I made Friday because it uses shop-bought mayonnaise rather than making your own. The dressing I used came from Thomasina Miers' Mexican Food Made Easy, one of my favourite books. And because I'm so lazy and there was so much left over, I ate the remainders for my tea - without the frankfurter but with baked prosciutto crumbled over the top.